Monteverde is a tourism hot spot because of the cloud forest reserves. The dirt road leading into town gives a sense of a quaint mountain village. This image is broken when you enter the town of Santa Elena, which is jam-packed with tourists, hotels, hostels, bed and breakfasts and farmstays nearby. Tour buses with “adventure” on the sides are just as common as the “turismo” buses pulling in. Reina Cruz, 32, grew up in Monteverde and has watched it become the ecotourism hotspot it is today. Cruz and her husband run Valle Campanas, renting out cabins to visitors who flock to see the natural wonder that is Monteverde. While tourism is greatly helping the economy, the trash generated by 250,000 visitors each year creates a logistical nightmare. Trash pick-up around town happens twice a week depending on the area, and while some people separate recyclables, many people just “throw out everything,” Cruz said. Cruz tries to separate all of her trash because she thinks it is important, but without an organized recyclables pick-up, that leaves her with a huge problem. 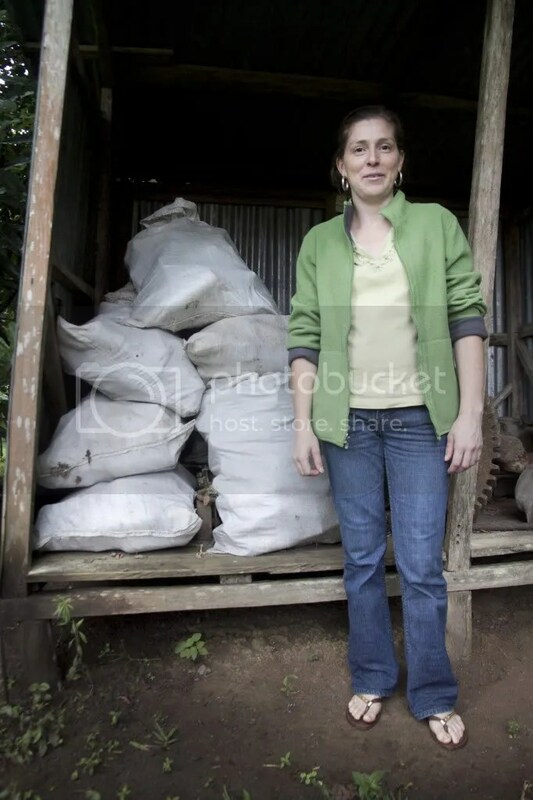 Reina Cruz in Santa Elena, Costa Rica, with 20 bags of recyclable glass accrued from her business. Photo by Keith Hickman-Perfetti. Cruz has 20 sacks of glass bottles stacked up in her shed. “We need a system of recycling in the community because there isn’t one,” she said, adding that once a month there is a collection of recyclables, but only plastics. Gray runs a local choir and his wife sells flowers she grows. Gray thinks part of the problem is a lack of communication. “We need a newspaper,” said Gray, adding that the community has an online bulletin but not everyone has a computer. The lack of coordination and dissemination of information has stymied recycling efforts. Cruz and Gray agree that they complain about recycling problems, but say that even if things were going well they wouldn’t know about it. Erick Lopez, 25, runs Multiservicios Gregorio Lopez, a repair business named after his father, who established the business. He has piles of scrap metal sitting on his front porch, along with myriad broken appliances. Lopez said that if someone brings him an appliance and it is too expensive to fix, they just leave it there. Every now and then someone will come along with a truck and buy the scrap metal, or “chatarra,” by the ton, and drive it to San José in hopes of selling it there. Lopez said buyers pay him 50 colones per kilogram for aluminum and 3,000 colones per kilogram for copper. The pick-ups are infrequent and barely contribute one percent to his annual income, but it is always welcome money. 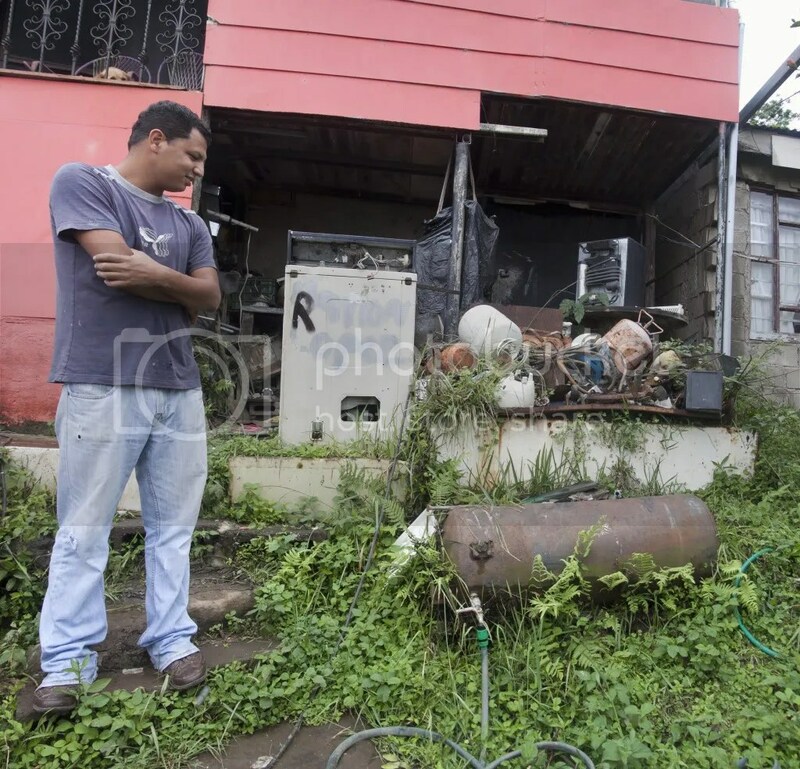 Erick Lopez in front of his house in Santa Elena, Costa Rica, with his 300kg of scrap metal, or “chatarra.” Photo by Keith Hickman-Perfetti. Lopez sometimes travels up to three hours to pick up appliances that people may or may not be able to afford for him to fix. In that case he puts it with the other discarded appliances on his front porch. Gray’s house is built to modern code. He has a compost pile and separates his recyclables. While he does his best to recycle and be environmentally conscious, he realizes not everyone does. “There is no fixed way, people here just handle it the way they think they should,” Gray said. Having grown up as farmers, many people burn their trash, he said, adding that he has a pile of garden clippings and when that grows too high he, too, burns it. Gray takes his recyclables to Poco a Poco, a hotel in the area committed to the idea of recycling. Poco a Poco started its program two years ago and tries to collect recyclables and promote conservationism, said Javier Solano, an employee of Poco a Poco. “Poco a Poco means bit by bit, and that’s how we view the problem,” Solano said. The hotel sells the recyclables to a company that takes it to San José and sells it there. The company gives the hotel 30 to 40 percent of the proceeds. “All the money we get from recycling is invested in community projects,” Solano said. The hotel buys office materials for schools and is organizing a music festival where the ticket to entry will be to bring recyclables. Poco a Poco also invests in reforesting projects. The hotel divides glass recyclables by color because different colors are worth different amounts. Even though the hotel wants people from the community to drop off their recyclables they just do not know about it. Cruz has those 20 bags of glass she thinks she needs to drop off at a center in Puntarenas, a two-hour drive away from home, and she said Pizzería Johnny’s has bags and bags of glass and is in the same boat she is. With Poco a Poco under a mile away willing to take their recyclables and use them to invest in the community, all they need is to be told about it. I'm a student journalist at the University of Arizona. Great article. Informative and interesting. Good photos so we can feel as if we were there with the author.